We’ve very proud to announce two more award wins for John Brown Media this year. 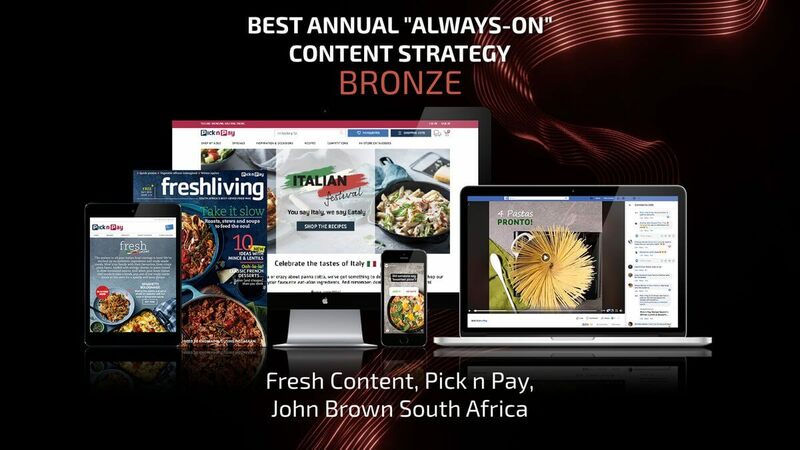 Last night, at the 2018 Content Marketing Association (CMA) Awards in London, John Brown Media won bronze for the Best Consumer and Best Annual ‘Always On’ Content Strategy categories for our work with Pick n Pay. John Brown Media’s award wins and nominations have been racking up this year, with three wins at the SA Publication Forum Awards, three nominations and a win from The Content Council Pearl Awards, to be held in New York next month, and now two wins from three nominations at the 2018 CMA Awards. While Coles and Tesco were also nominated for Best Annual ‘Always On’ Content Strategy, and Tesco and Asda were nominated for Best Consumer, Pick n Pay was the only retailer to win in both categories. A detailed list of Content Marketing Association Award winners are expected to be released later this week.